Christmas Present from the Sis and Bro-law. My crafty sister and brother-in-law presented me with this early Christmas present the other day at their holiday dinner. 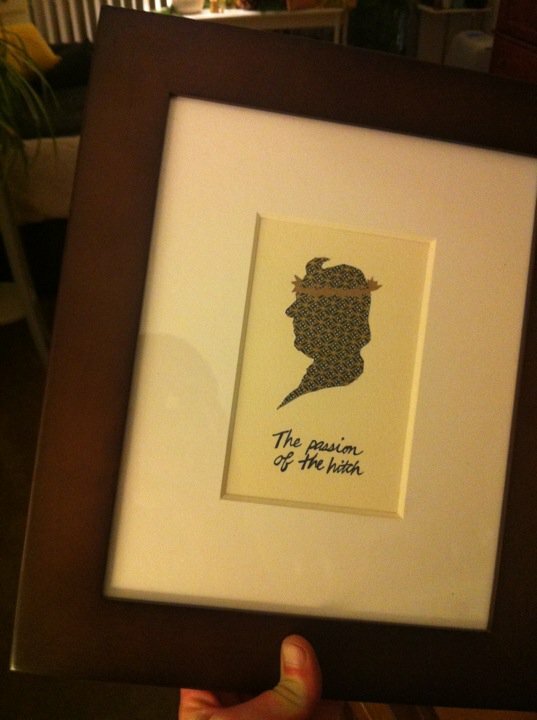 It’s homemade, and features the silhouette of a pre-cancerous Hitchens donning an ironic crown of thorns with the words “The Passion of the Hitch” scrawled beneath it. Hitchens and the crown appear to both be made out of cloth. This will make a handsome addition to my home. To see more of my sisters work, visit her blog at Rabbit Foot Fern, or drop by her Etsy store. In addition, prints of my Hitchens portrait are now for sale on my website, Adrian Covert Web.